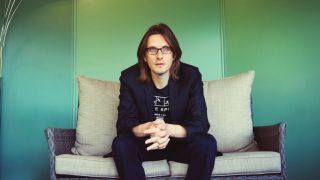 Steven Wilson has confirmed that the fifth Blackfield album will arrive on November 18 via Kscope. He’s also gearing up for a general release of limited-edition 2015 solo record Transience, complete with an additional track, and a fresh run of tour dates. He adds: “Written and recorded over a period of 18 months in both Israel and England, Blackfield V contains 13 linked songs that form a flowing 45-minute ocean themed song cycle. “With the pair expertly handling vocals, guitars, and keyboards, Tomer Z from the Blackfield band on drums, and string arrangements performed by the London Session Orchestra, the album is a powerful journey through catchy melodies, lush arrangements, and stunning production. Meanwhile, Transience is to be launched on CD this month, after having only been available in a one-off vinyl pressing last year. It now includes the track Happiness III from recent mini-album 4½. Wilson reports: “I’m not normally a fan of compilations, but I liked the idea of collecting the more accessible side of my solo material as an introduction for listeners who may not be familiar with my music. The track is also available as a single, with a live version of David Bowie’s Space Oddity on the B-side. Both releases will be available on September 16. Wilson has also announced a run of North American shows for November.